Thank you to everyone who came out and contributed to the shows! We are still gathering photos and videos of the performance and will update soon: here are a few! Do we have to see to believe? Do we have to listen to know? Do we have to touch to feel? How can we cope with the emotions elicited from the heart-and mind-breaking news of the environmental devastation we consume daily? These are the questions The Wailing asks. Through a performance of sound and movement, local artists, musicians and community members will summon a pod of ghostly whales situated in a variety of unusual places to rise and fall, dance and land, breathe and expire. All to bring us to a place where we can hear, feel and touch realities we cannot, and should not have to face alone. The Wailing is a ceremony, it is a wake, it is an honouring of the dying and surviving species we share this planet with. 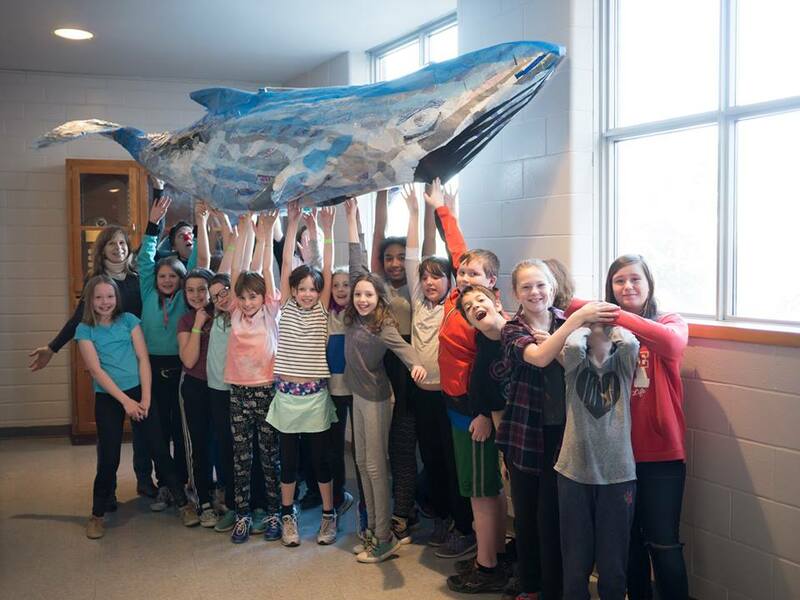 This project is a point on a continuum, beginning with a classroom of grade 5 students at Queen Mary P.S., who in the fall of 2017 explored ways in which we could transform single-use plastics into materials we could incorporate into artist works. With the help of artists Laurel Paluck, Katherine Bahun, Christie Haldane, Hilary Wear and Hartley Stevenson, Chi Giigoonh, was born. This project was followed in the Spring of 2018, in Mazatlan, Mexico, where students, artists, scientists and other curious folk continued to explore ways to divert plastic pollution destined towards the ocean and turn it into wearable works of art. Both projects focused heavily on the positive aspects of transformation. Turning poison into beauty. Finding hope in devastation. The Wailing continues on this path, but takes an important turn. If we now are beyond the tipping point, where are we? Perhaps only through an expression of mourning can we come to fully realize where we stand now. Together. On this planet. The Wailing is a funeral, it is a wakening of our emotions, an acknowledgment of our experience. It may may be a quickening of life struggling to be born, it may be an acceptance of death. It is yours to choose. It is ours to share. We invite all members of our community to engage in ways that both challenge and console, as best suit your needs and abilities. The Wailers, share your voice. Wailers will be taught a simple canto to sing within a choir, as we call the whales down to our gathering space. Whale Dancers, bring your body. Whale Dancers will be taught how to lift and move lightweight whale figures down a hill in a simple series of movements. Costumed Guests, bear witness. Guests will be fitted with theatrical outfits, led in a procession to our gathering space and asked to remain silent while moving through the audience. Participants need not attend each rehearsal, but a minimum of 3 dates is requested. Please note: Every participant will be asked to lay their bodies down (as best they can) for the finale of the performance and remain motionless for up to 3 minutes. Each participant must consent to be photographed within the collective images our performances create. If you would like to engage with this project please contact us at LollyPluck at gmail dot com. The Whale’s song is an original piece of music composed by Kathleen Adamson for this project. She has incorporated Celtic laments and Gregorian funeral chants with a thrumming, oceanic drone to create a hymn to lead us to the gathering place. The Whale figures for this performance are created by Laurel Paluck. Utilizing plastic films rescued from local shops and households destined for landfill and waterways, skeins of “Ocean Leather” will be created to produced the skins of the whales through a process of fusing and burnishing. This project is in part supported by Artsweek Peterborough. To add your financial support to this project, and its future touring, please consider purchasing a piece of “Ocean Leather”, made available at our performances.